Lotus Elan Central • View topic - Which mod is deleting my posts???? Which mod is deleting my posts???? I've had a few posts deleted in the last 24 hours by a mysterious moderator. Titles like: "PCE vs. de-stuffed Pre Cat" and "Exhaust options in the USA?" Last edited by lotos on Thu 23.10.2008, 21:57, edited 1 time in total. Re: Which mod is deleting my posts???? I PM'd you after the initial onslaught and pointed you in the direction of the "please think twice before creating duplicate topics" post in the New User Help section. The response I received was that it was a rookie mistake. Well apparently it wasn't. Both of the deleted posts were new threads starting duplicate topics that were being discussed elsewhere. Shipping of PCE's and exhausts to the US if I remember correctly, when exactly the same thing was being discussed in the Piper thread? Now, do we carry this one on in public or consign it to oblivion too? Regarding PCE vs. scooped-out Pre-cats, I'd love if you could direct me to that previous discussion, I couldn't find that specific question answered. Regarding exhausts, I was asking if any exhausts were currently available in the USA, as Piper had just responded that they hadn't shipped to the US because shipping was astronomical. Seems like a valid question to ask, and others may be wondering the same thing. Thanks - Since my original post is gone, what I was asking is the difference in performance PCE versus just scooping the ceramic junk from your existing Pre-Cat. And like I said, the Piper thread doesn't answer my exhaust q. Duplicate threads just dilute BOTH discussions and make searching for relevant information in the future a nightmare, which gives rise to even more duplicates. It's an ever INcreasing circle - I could easily point you towards websites that are now irretrievably difficult to find anything useful on, and are very poor and impersonal places to visit because of it. Now that I have a little more time to reply properly regarding these particular deleted posts: I would suggest that once the first few Piper exhausts and PCE's have gone out and got rave reviews, it shouldn't be too difficult to drum up sufficient interest across the pond to justify a further group buy of say 5, and consolidate shipping. Just because Piper haven't shipped to the US before doesn't mean that they won't. But even IF they won't, then there are plenty of helpful souls over here who could be persuaded to forward a crate for distribution. It's worth investigating further because the pound is at a 5 year low against the dollar, so that could massively offset any shipping costs. And the threads to ask these questions in are even already in the right place - the group buy section. good of you to ask what happened to them, Randy. It's just that anymore we have enough help that we try to keep multiple threads on the same topic at the same time. Now I'm not familiar with those threads to say, but if you are asking something different about something on the same topic then I think a new thread is fine. You could always start a new thread for "Randy's questions about his Elan" or something like that and then you have your own forum for asking things . . .
Peco have shipped exhausts to the US in the past. It would be worth talking to Algirdas as he has half a garage of stuff to ship over sometime next year (well I hope he is, because it's in half of my garage ). He's recently boxed up and sent a gearbox from the UK and has experience of sending the odd bodyshell and chassis over the pond. 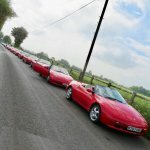 Doug wrote: You could always start a new thread for "Randy's questions about his Elan"
.... or rename this one? I read the entire Piper thread, but thought it rude to discuss what OTHER exhausts might be available locally to Americans - in the Piper thread where they're drumming up sales. I'll also briefly state that IMHO the massive multi-page threads aren't exactly user-friendly and easily searchable to find answers. Threads with a simple question and straightforward answers are most helpful to people doing searches and in similar situations. If the true goal is to make it easier to find information, posts exactly like the two that were deleted would have been helpful to others in my shoes. This isn't that big a deal. I'm not new to forums. (I'm not even new to this forum.) I've been moderating half a dozen of them myself for many, many years. Just lock this thread and let's move on.